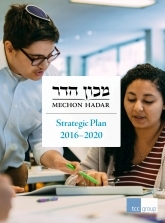 We are thrilled to share Hadar's Strategic Plan: 2016-2020, our first-ever formal strategic plan! In a process supported by the Jim Joseph Foundation, and guided by TCC Group, we engaged in an 8-month process engaging dozens of internal and external stakeholders, staff, alumni and partners in the field. We emerged with three strategic programmatic goals and one capacity goal, to be accomplished over the next four years. These goals represent a doubling down on what we do best, as well as a series of “stretch” goals to push our work further and advance our long-term vision. The support and guidance we have received from our community over the years have been indispensable elements of this process; thank you! We hope you take a look at the plan, and please feel free to email info@hadar.org with any thoughts or questions.